The Lynx was a unique venture into the world of hand held gaming by Atari. In many respects it was before it’s time with features beyond its competitors. It also had a few other interesting features that are not found now days. For those unfamiliar with the Atari Lynx, here is a brief history: The software company Epyx, makers of games such as “Pit Stop” and the awesome “California Games,” decided to branch out into the hardware market and started to develop a hand held game console. Called the “Handy” it started its life in planning in 1986/1987. The Handy was shown off at the Winter Consumer Electronics Show in 1989, but by that time Epyx had hit financial troubles. They invited companies to partner with them to manufacture the Handy and Atari accepted. The Handy was to be manufactured by Atari and Epyx would handle the software. Atari eventually renamed the System the Lynx before sending it to stores in late 1989. One of the things I have noticed with some Atari consoles is that when you put the games in, they seem to face backwards. With the 2600 and the 7800 the game labels both face away from what you would assume to be the front of the console. It is something that I always thought was odd. 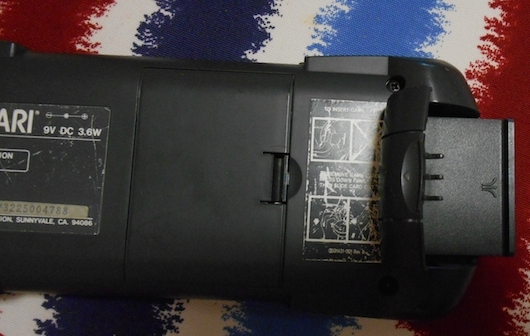 Most (if not all) other consoles have the label facing the front, including other Atari consoles. 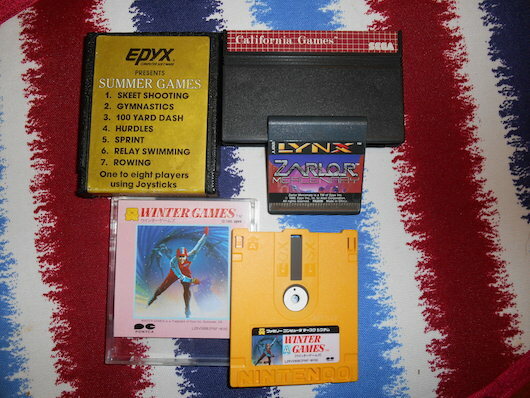 The first Lynx that I owned was a Lynx II, and I noticed that the games also went in backwards, with the labels facing inwards. Every other hand-held I owned or knew of, the label faced outwards, telling the world proudly what game you were playing. Not the Lynx. The Lynx seemed to be ashamed of your choice of game. Admittedly, you can’t see all of the game label with the game in the Game Boy or Game Gear, but you can see enough to make out what game it is,usually with the title showing. 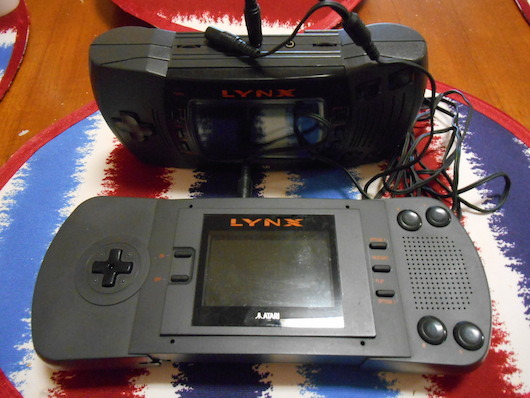 The original Lynx went even further that the Lynx II in hiding your choice of games. When I first bought the original Lynx (second hand with no manual) I couldn’t even work out where the games went in. After a few minutes of exploring the console, I discovered the hidden panel behind the D-pad where the games go in. Not only do the games go in backwards, but they go in on the side and behind a hidden panel. My mind was blown. The original model completely hid the game and the revised model still kept the title of the game a secret from the rest of the world. The Atari Lynx was the first hand-held console to have a colour screen, beating out the Sega Game Gear and the NEC TurboExpress / PC Engine GT by about a year (the NEC also not even making it to Australia). The Lynx also has a bigger screen than all of its contemporaries with a whopping 3.5” back-lit screen. This also meant that compared to the four-shades-of-green Game Boy, the Lynx chewed though batteries the way I chew though a pack of Skittles; quickly. The massive colour screen wasn’t the only high-tech advantage that the Lynx had over its competitors; it had networking capabilities far beyond the other hand-held at the time. Where the Game Gear had a two player link cable and the Game Boy had a two player cable and four way adapter, The Lynx had a two player link cable that could be daisy chain 18 units together. That’s right, the Lynx was capable of having 18 players at one time. Most games only supported 2-4 players, with the exception of “Battle Wheels,” and “Checkered Flag” supporting up to 6 and “Todd’s Adventures in Slime World” supporting up to 8 players. The hard part would be finding 8 people who owned a Lynx. There was one other thing that set the Lynx apart from it’s rivals, a feature that I do not think has been on a hand held system since: the Lynx is ambidextrous. Due to it having two A and B buttons and a function that flips the screen upside down, the Lynx can be used “Left handed” with the D-pad being controlled by the right hand instead of the traditional left hand for D-pad. This layout also allowed the Lynx to play games like “Klax” and “Gauntlet: The Third Encounter” side on. It was not until the DS came along that playing a hand-held side on become mainstream. 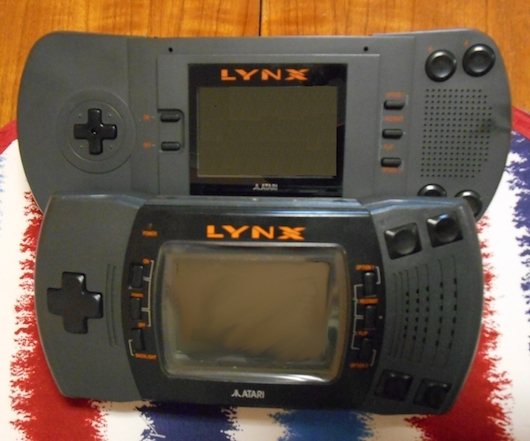 Being that the Lynx was designed to be ambidextrous, then the original location of the game cartridge makes sense. Left or right handed, the game is never put in upside down, so as not to favour one way or another. The console was never to be played “upside down,” as there was no upside down, promoting equality between “Lefties” and “Righties.” or maybe I’m just looking to much into this? Ultimately the Lynx failed despite its advantages. A price that was twice that of the Game Boy, A battery life that to describe as ‘short’ would be generous and a library of games, that when compared the to competition, was limited. Not even being ambidextrous could save the Lynx.